DENVER, April 20, 2017 /PRNewswire/ -- MusclePharm Corporation (OTCQB: MSLP) ("MusclePharm" or the "Company"), a scientifically-driven, performance lifestyle sports nutrition company, announced today that it has reformulated and relaunched its popular Re-Con product. The new and improved Re-Con is available as part of the Company's Sports Series. As one of the only sports nutrition companies with a scientific institute that tests ingredients and develops research in-house, as well as partners with prestigious universities and research institutions, MusclePharm reevaluates its products on an ongoing basis to ensure that it is using the best ingredients currently available. After extensive research, the Company has reformulated Re-Con to include Groplex(™) and VitaCherry(™) Sport. Currently, Re-Con is the only workout recovery product available that includes these ingredients. GroPlex, developed by Glanbia, a leading creator of ingredient solutions for the food, beverage and supplement industries, is a unique complex of dairy proteins and peptides that are high in protein but low in fat and carbohydrates. GroPlex has been shown to cause a release of the anabolic or muscle building hormone insulin, which can improve the delivery of nutrients to muscle and activates the muscle growth pathway (MTOR) for muscle synthesis. VitaCherry, developed in collaboration with Futureceuticals VDF, is a carefully processed whole tart cherry, which has traditionally been used by athletes for recovery and to promote reduction in muscle soreness. VitaCherry Sport is processed in a way that yields higher concentrations of the beneficial nutrients that prevent muscle soreness. "As one of the only sports nutrition companies able and committed to conducting primary research, MusclePharm is uniquely positioned to validate the impact of the latest ingredients that support athletic performance and health," said Ryan Drexler, CEO and Chairman of the Board, "Over the past 18 months we undertook a review of some of our best-selling products – including Assault, Combat Protein and Shred – and made significant improvements. Re-Con is the latest example of this effort. 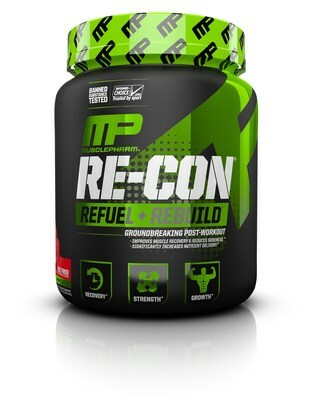 As a result, I am confident that the thousands of retail outlets around the world, both brick and mortar and online, that carry MusclePharm products will add the newly formulated Re-Con to their line." Re-Con was developed for use by all types of athletes – from professionals to weekend warriors. The product's benefits include: reduction of muscle soreness, repair of damaged muscles and replenishment of vital nutrients for the body post-workout.